At the passing of the ‘Intramural Burial Act (Ireland)', 1855, the corporation of Cork established the new cemetery of St Finbarr’s, at a cost of £12,000. 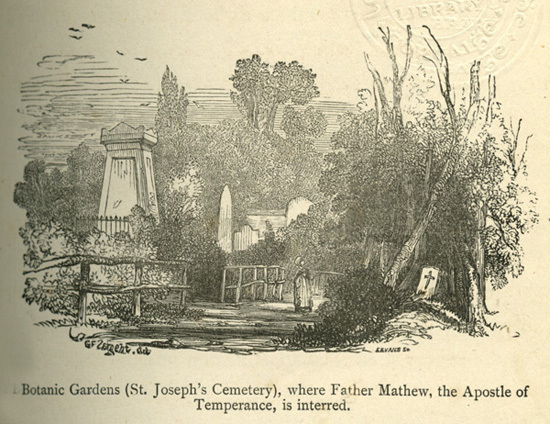 Whereas, St Joseph’s cemetery was brought about by the temperance Catholic priest, Father Theobald Mathew, twenty five years earlier, who aquired the site of the former Botanic Gardens founded on Tory Top Lane, (now Tory Top Road) 1807, by Presbyterian Minister, Reverend Dr. Thomas Dix Hincks (1767-1857) of the 'Royal Cork Institution' which he also established, 1802. This Father Mathew gave to his fellow priest, Richard Crowley, (Capuchins??) on a 999 year lease. Aged just twenty-two, Scottish born botanist, James Drummond (1786-1863) was selected by Reverend Hincks as curator for his new Botanic garden. This Drummond continued until its closure, due to lack of funds, 1828. Upon the garden’s closure, James Drummond, with his wife, Sarah Maxwell Mackintosh, and their six children travelled to Swan River Colony, Western Australia where they settled. 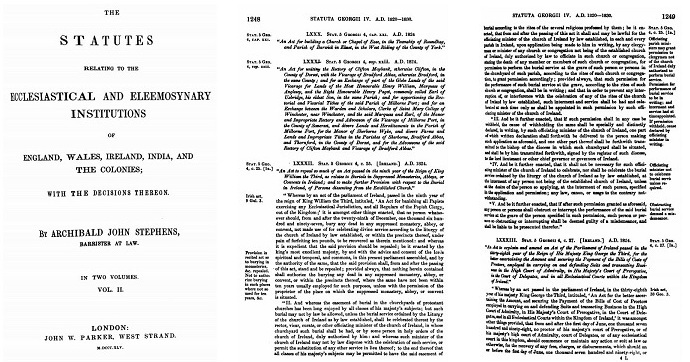 By the terms of the Burial Act (Ireland) 1824 (5 Geo 4 c 25); no Catholic Priest shall officiate at burials without the express permission of the local bishop, or rector of the so called established faith. At this time, cemeteries in County Cork were completely under Protestant control, and their burial fees were exorbitant. 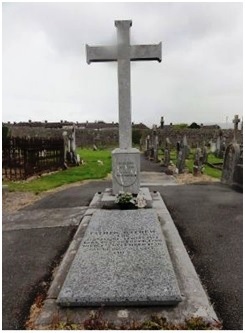 Nor were there any cemeteries attached the city’s catholic parishes of; St Finbarr’s South Parish, St Mary’s North Cathedral Parish, SS Peter & Paul City Parish, or St Patrick’s. 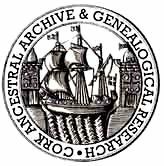 Consequently, this led to an eventual confrontation between the Protestant Dean of Cork, Rev Mr Burrowes, and Dean Jeremiah Collins, Parish Priest of South Parish at this time. A messenger of Rev Burrowes actually interrupted a burial Dean Collins was officiating, ordering him to desist. "The insults offered to Catholic priests who were often grossly outraged in Protestant Churchyards, the large fees demanded from the very poorest for the internment of their relatives, induced me to open my large and very beautiful burial ground"
The Botanic Gardens were blessed and dedicated as St Joseph’s Cemetery, February 1830 by Archbishop Robert Laffan of Cashel, assisted by the Venerable Archdeacon Thomas O’Keeffe, V.G. (1814 - 1847), to commemorate the opening of Father Mathew’s cemetery, and was just in time for the cholera epidemic of 1832; and receiving the bodies of more than £10,000 victims of the famine years. This area, known as the 'Poor Ground' of unmarked graves, was provided free of charge for those unable to pay burial fees for the internment of their loved ones. Sir THOMAS DEANE had a gratifying circumstance to communicate by which the Board would be saved as much per annum as they had voted as an encrease to the salaries of the Nursetenders on last day of meeting. The Rev. Mr. Mathew had signified his intention to the Steward of making no demand for internment from the House, at his cemetery the Botanic Garden. This kind offer fir which he (Sir Thomas) would move the thanks of the Board, would make a saving to the House of over £10 a year. Dr BULLEN instanced the occasion when, during the prevalence of cholera, the Rev. Mr. Mathew had gratuitously given a piece of ground for the internment of the poorer orders, who died of this disease. Dr BULLEN – I know it was not, Sir. Mr O’BRIEN - Before the resolution is put, I beg to make an observation. The Rev. Gentleman in question has not only on this occasion, but on several, given large sums to this House. He has provided the inmates with dinners, and made them many bequests; in fact, he had given more to the Institution, than all the Clergymen of every denomination in this city, with the exception of the Rev. Archdeacon O’Keeffe, who paid £50 a year out of his own pocket to it; yet for all this, the Rev. Mr Mathew was never found worthy of being made an honorary Governor, tho’ there never was a clergyman of the established Church who attended one day that was not paid that compliment. 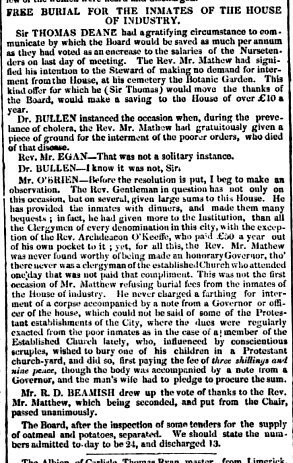 This was not the first occasion of Mr Mathew refusing burial fees from the inmates of the House of industry. He never charged a farthing for internment of a corpse accompanied by a note from the Governor or officer of the House, which could not be said of some of the Protestant establishments of this city, where dues were regularly extracted from the poor inmates as in the case of a member of the Established Church lately, who, influenced by conscientious scruples, whished to bury one of his children in a Protestant church-yard, and did so, first paying the fee of three shillings and nine pence, though the body was accompanied by a note from a Governor, and the man’s wife had to pledge to procure the sum. Mr R. D. BEAMISH drew up the vote of thanks to the Rev. Mr Matthew, which being seconded, and put from the chair, passed unanimously. The board, after the inspection of some tenders for supply of oatmeal and potatoes, separated. We state the number being admitted to-day to be 24, and discharged 13. The valuation book of 1847 for Tory Top Lane contain two very significate statements made by Francis C Smith of 23 Marlboro Street & 88 South Mall, Cork City, in relation to ‘Ground Rent’, and land ownership. 23/24 Marlboro Street was also the address of the tailoring business of the firm ‘Murphy & O’Connor’. At this time the business was operated by James and William O’Connor. James died two years later, 1849, being interred within the family plot at this cemetery. William O’Connor build the Father Mathew tower in honour of his friend, Father Mathew. Mr Smith of Marlborough St. Attorney, says Father Mathew is O’Keefe’s landlord, as this is included in his holding of the Lawn & Graveyard from the Rev Richard Crowley. [….] House in a great state of ruin in the cemetery – a part of the cemetery adjoining the east Road and about [7a] the ground is a different take for the remainder of the cemetery but he pays Rent for all to owner Landlor d Revd Richard Crowley. "The Sisters of the Queenstown Convent watched and prayed constantly by his bedside. ‘Theobald, would you wish to be buried with Frank and Tom?’ his brother Charles enquired of him, as the last hours were approaching. The dying man signified a negative. ‘Is it in the cemetery?’ ‘Yes,’ was plainly indicated. ‘Is it under the cross?’ A sweet but faint smile, and fainter pressure of the almost lifeless hand, was the only reply"
Father Theobald Mathew, of Blackamoor Lane, and of Holy Trinity, Cork, died, 8th December 1856, of a stroke at the Sisters of Mercy Convent, Queenstown, 42 years a priest, aged 66, and was laid to rest at his own request at the foot of the large stone cross indicating his last resting place at the centre of his own cemetery. From A history of the city and county of Cork by Mary F.C. Cusack. Cork: Francis Guy, 1875.